Executing SQL scripts for creating, modifying, and deleting database objects (DDL) and data (DML). Exporting database data into text, CSV, and HTML. Preparing configuration files for importing CSV files into databases. Generating INSERT, UPDATE, DELETE, and MERGE commands for CSV files. Importing CSV files into databases. gsqlcmd solves these tasks easier than native database command line utilities. Moreover, it has the same syntax for all supported database platforms. See Command Line for a complete description. You may use the exit codes in batch files. However, gsqlcmd supports a better way. This is an awesome feature if you work with embedded databases. gsqlcmd rtd-mysql "SELECT * FROM INFORMATION_SCHEMA.TABLES"
This command produces a plain text. gsqlcmd writes output to the console and *.txt files as a plain text by default. gsqlcmd writes the output to *.csv files as CSV by default. You may turn off the use of the template with the /notemplate option. You may define values for SQL commands and scripts using the /set option. and as :<Parameter> for MySQL, MariaDB, Oracle Database, IBM DB2, NuoDB, and PostgreSQL. Do not use the /set option with scripts that declare variables calculated by database servers. For example, do not use the /set option with the create statements of stored procedures and triggers. SQL scripts can contain the -- print <Message> command. gsqlcmd execute such commands internally and writes messages to the output. It is a useful feature for monitoring script execution progress. This feature works for all databases servers in the same manner even a server does not support print commands. gsqlcmd executes SQL commands in the ReadCommitted transaction isolation level. So, the default rule is "all or nothing." You may turn off a transaction mode using the /notransaction option. You may use this, for example, for deleting database objects using scripts as some of the deleted objects may not exist. If a script has errors, turn on the trace mode using the /trace option. By default, gsqlcmd writes trace messages to the console. 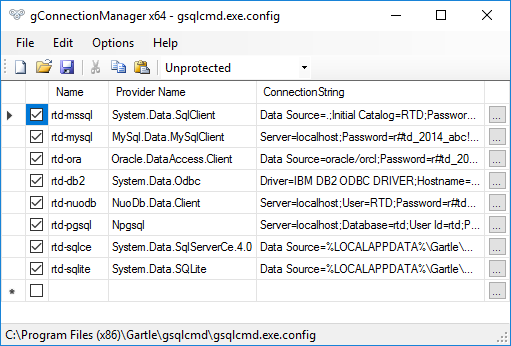 You may redirect the trace messages to a log file using the gsqlcmd.exe.config configuration file. Format files for OPENROWSET(BUCK...) import (SQL Server only). INI files for ODBC drivers. INSERT INTO ... SELECT statements for OPENROWSET(BUCK...) import (SQL Server only). INSERT INTO ... SELECT statements for OPENROWSET using MICROSOFT.ACE.OLEDB.12.0 (SQL Server only). Originally, format files are used with the Microsoft SQL Server bcp command line utility and the OPENROWSET(BUCK...) function. gsqlcmd allows generating such files and uses them as column name data sources in other modes. So, you may generate the format file first, edit it, and then generate other files. 1   SQLCHAR   0  255  ";"          1   "ID"                           ""
2   SQLCHAR   0  255  ";"          2   "Date"                         ""
3   SQLCHAR   0  255  ";\""        3   "Sum"                          ""
4   SQLCHAR   0  255  "\";\""      4   "AccountName"                  ""
5   SQLCHAR   0  255  "\";\""      5   "CompanyName"                  ""
6   SQLCHAR   0  255  "\";\""      6   "ItemName"                     ""
7   SQLCHAR   0  255  "\"\r\n"     7   "Comment"                      ""
You may disable column import replacing the column index (column 6) with 0. You may specify the target database platform using the options: /mssql, /sqlce, /mysql, /oracle, /db2, /nuodb, /pgsql, or /sqlite. Verify and change column data types. In the example, the [Sum] column created as int as the source column contains the integer values only. You may change int to money or to float, for example. You may import CSV data into Microsoft SQL Server using the bcp command line utility included in Microsoft SQL Server client packages. The -E option keeps identity values. The bcp utility does not support the UTF-8 encoding. So, you may convert CSV data into Windows ANSI encoding or to use methods described below. See details about the bcp utility at https://msdn.microsoft.com/en-us/library/ms162802.aspx. If you do not specify the /table option, gsqlcmd does not generate the INSERT INTO header. If you specify the /insertIdentity option, gsqlcmd generates the SET IDENTITY_INSERT statements to insert the identity column from the source CSV file. You may skip the source identity column specifying 0 in column 6 of the format file. The OPENROWSET function requires absolute paths of the CSV and format files. You have to edit paths to your real file locations. You may import the data using this file if the paths are available for your SQL Server instance. Also, you may insert this code into a stored procedure. gsqlcmd execute <Connection> "SELECT * FROM dbo.Payment"
You may easily create schema.ini file sections used with ODBC. Copy and paste these rows into the required schema.ini file. The bcp utility and the OPENROWSET(BUCK...) function do not support the UTF-8 encoding. As a solution, you may use the MICROSOFT.ACE.OLEDB.12.0 provider with the OPENROWSET function. To use this code, you have to insert [payments.csv] section into the schema.ini file. See the previous topic. You may generate INSERT statements to insert CSV data into databases. gsqlcmd requires a connection as the first parameter in the insert mode. The example uses the AzureDemo connection. gsqlcmd loads the target table definition and generates the code specific to the target database platform. You may specify the /insertIdentity option to insert identity values from the source CSV file. The free gsqlcmd version allows generating INSERT statements for CSV files with less that 50 rows. You may purchase gsqlcmd Personal or gsqlcmd Enterprise to remove this limit. You may generate INSERT and UPDATE statements to merge CSV data into the desired table. You may use the /singleLineSQL option to generate single line commands. The free gsqlcmd version allows generating MERGE statements for CSV files with less that 50 rows.